After replacing the calipers, pads and rotors on a 1997 Pontiac Grand Am to fix a problem with a seized caliper, the problem re-occurred. Two weeks after the repair the wheel was smoking hot as the new caliper became locked on to the new rotor. I intended to replace the brake hose as part of the initial repair, but it was seized to the flared fitting and the flared fitting was seized to the brake line. Well, now the hose would have to come off. This is not a difficult job if the fittings are freely turning. I have two sets of instructions here. One is for doing the job with a properly free flare nut fitting on the brake line. The other is for a seized fitting. Have the replacement hose ready to install immediately upon removing the old hose. If the master cylinder reservoir is allowed to go dry, a complete and time consuming four wheel brake bleed will be necessary. 1) Turn off the flare nut with a 12 mm flare nut wrench. Free the brake hose from the brake line. 2) Remove the spring clip that holds the hose to the bracket. it will push out toward the wheel well. 3) Unbolt the 12 mm brake hose bracket bolt from the wheel well. 4) Unbolt the 11 mm banjo fitting from the caliper. 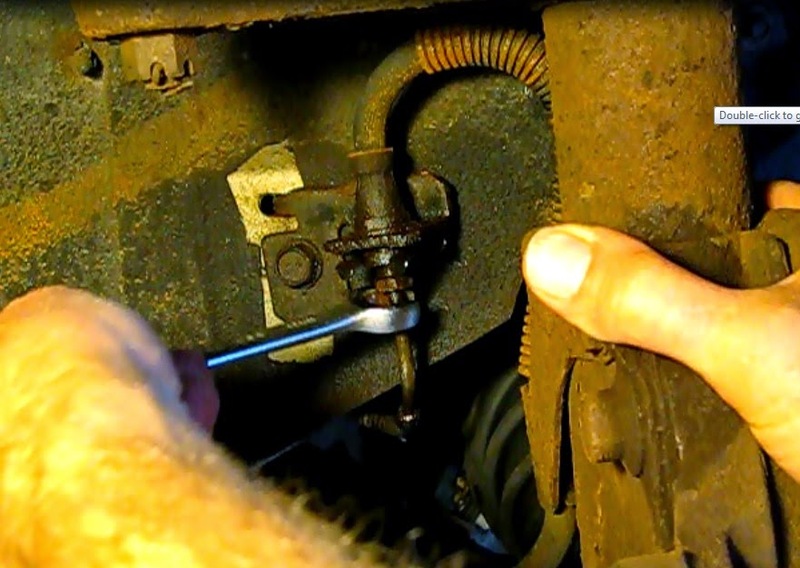 Make sure to be ready to catch brake fluid. 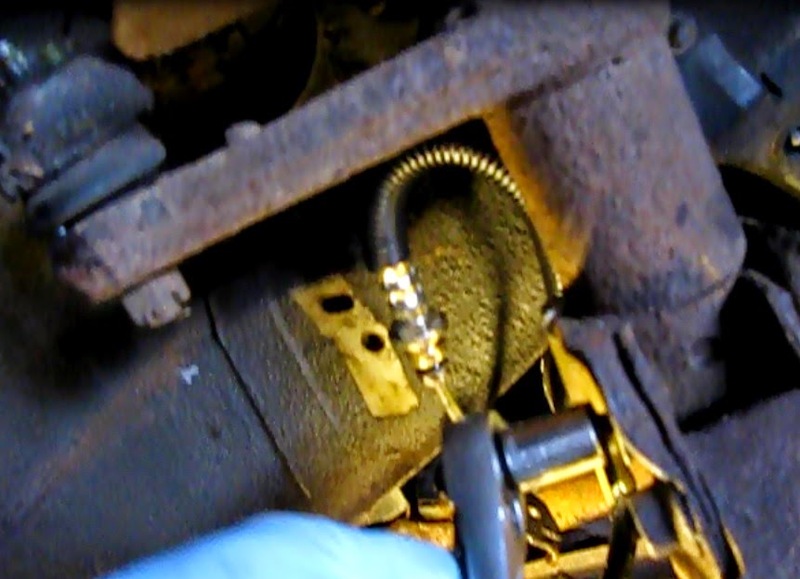 Re-install the new hose with some urgency to avoid a four wheel brake bleed. A look at the "one way hose"
Curiosity led me to examine the bad hose for the cause of the problem. I inserted a small gauge steel cable into the hose. It stopped right around where the mounting bracket was crimped onto the hose. I cut the bracket off for further study. I cut the hose in half where the obstruction seemed to be. Now the cable would pass through both pieces of the hose. 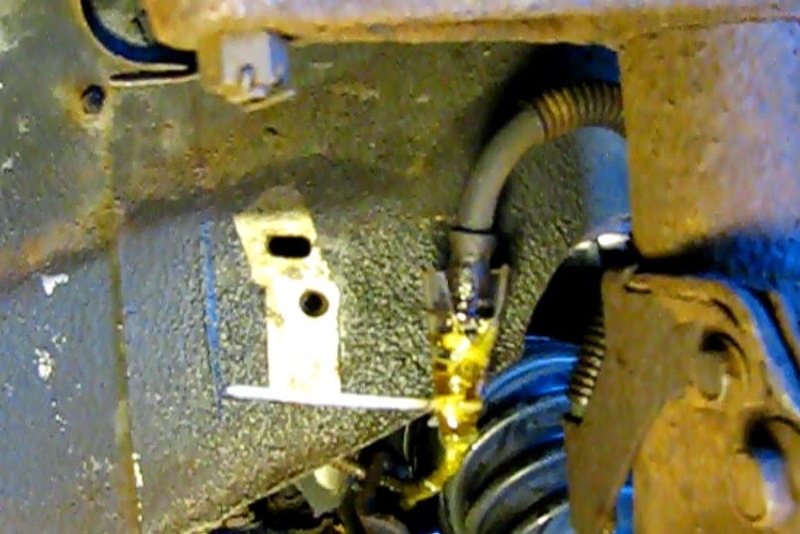 Conclusion: a bubble of rust on the inside of the bracket had pinched off the brake hose. Make sure to use anti-seize compound on all fasteners. 1) Mount the new brake hose onto the wheel well bracket. The two are keyed and will go together only one way. 2) Re-insert the spring clip. A channel lock pliers will work well here. 3) Mount hose and bracket to the wheel well with a 12 mm bolt. 4) Attach the banjo fitting with the special 11 mm bolt. Note: the fitting has an inside and outside. It will only go on one way. Make sure to use new washers (provided with the new hose). Torque to 33 ft lbs. 5) Mount the hose bracket to the strut tower with the 12 mm bolt. 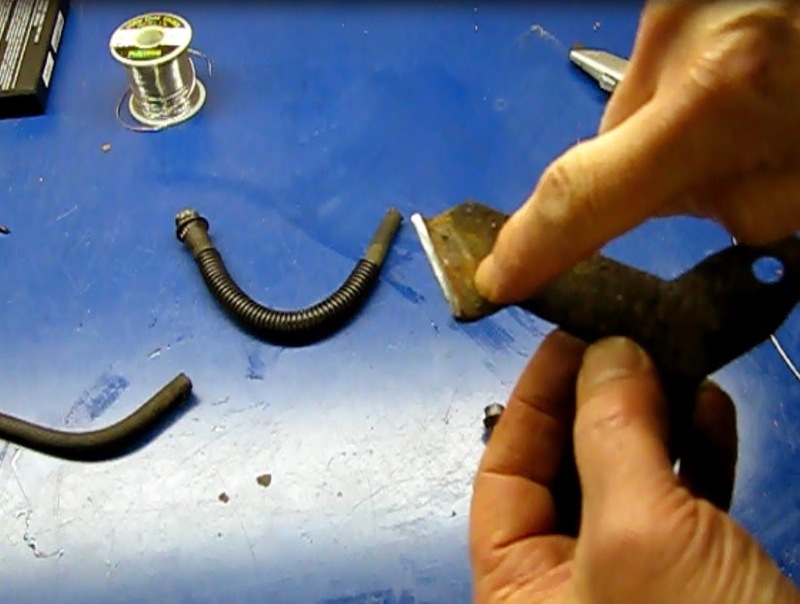 6) Turn the brake line 12 mm flare nut into the brake hose. Torque up good and snug. Some tips for doing this job with seized fittings. Since everything was seized up, I set up it up for a little soak with some PB Blaster. 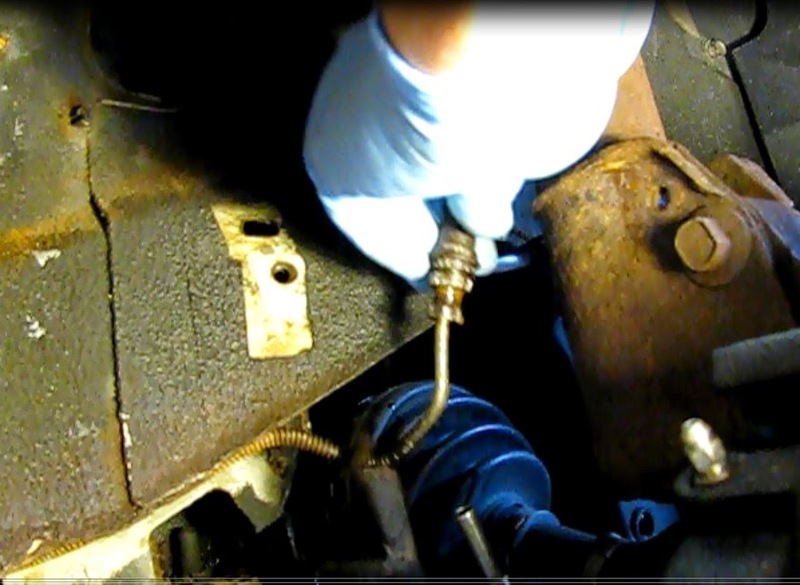 1) Remove the wheel well bracket in an attempt to free the hose from the flare fitting without turning the flare at all. The half inch bolt put up a fight, but careful and consistent back and forth turning along with liberal shots of PB Blaster got it moving out. 2) Remove the spring clip that holds the hose to the bracket. Work it toward the wheel well with a couple of screwdrivers. 3) Unbolt the 12 mm bracket bolt from the strut tower. 4) Wrap a two inch piece of vinyl tubing around the end of the stuck hose and closed it into a funnel shape with a zip tie. Then I put some silicone around the bottom to seal it. The sealed funnel was then filled with a penitrant. let it soak for a day. It worked. The hose came free of the flare fitting. The flare fitting was still seized to the brake line though. 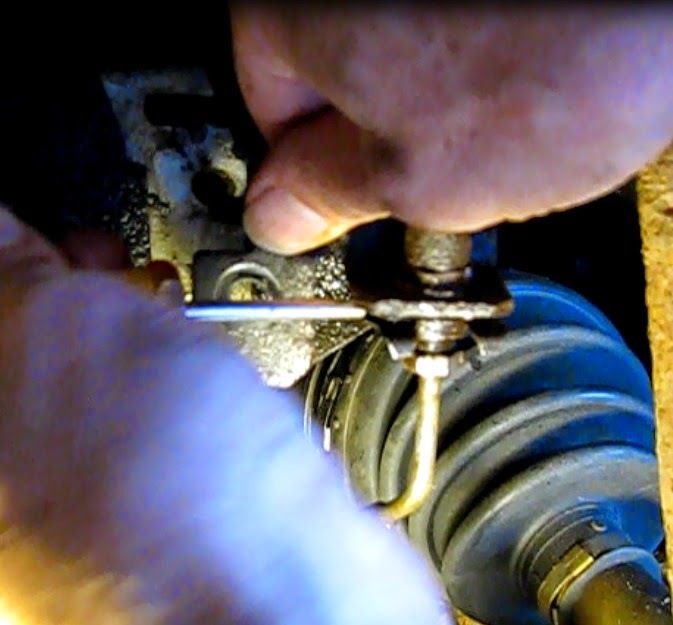 5) Unbolt the banjo fitting at the caliper. Have something to catch the brake fluid. 6) Turn off the brake hose. There is plenty of room to do this. 1) Turn the new hose onto the flare fitting. Tighten by turning the hose with a 5/8" open wrench while holding the flare nut with a 12 mm wrench. 3) Attach the banjo fitting with the special 11 mm bolt. Note: the fitting has an inside and outside. It will only go on one way. Make sure to use new washers (provided with the new hose). Torque to 33 ft lbs. 4) Mount the hose bracket to the strut tower with the 12 mm bolt. 5) Bleed the line worked on or all four if the master reservoir went dry. 6) Test drive and check for leaks. The reassembly of these fittings in this last section were extremely detailed and well thought out! Now in tip five, you say to "bleed the line," but I don't know exactly what you mean by this. Overall with all of these instructions, I'm really impressed with your sheer experience with these fittings. We're going to definitely benefit from your knowledge of properly fitting these pieces together. Thanks! You know, it's really hard for a girl like me take care of my baby car. I'm a student and trying to cope with all of the problems by myself or using the web. For example, to choose a writing service I use EssayExplorer.com - here I read the reviews and after with confidence using writing service. To find a solution to the problems with my car I'm using your site. Thank you for that!